Ok, let's face it -- outdoor grills, even the fancy ones, are only nice looking when they are opened up and being used. So, if you are like me and have had the misfortune of being forced to look at your ghastly black covered grill all winter long -- through the snow, the rain, the ice -- then, by golly, be sure to get outside and use it during the summer -- while you can! 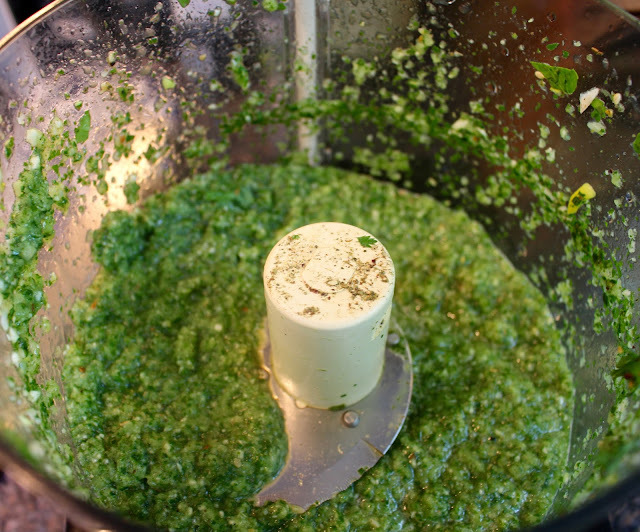 In my opinion, the real task of grilling has less to do with time spent at the grill and more to do with the time spent marinating. Recently, I brought some marinated shell steak to a dinner party and the hostess asked if I would post the recipe, it was absolutely delicious and disappeared quickly. So, here it is. I just had to use this photo, somewhere! 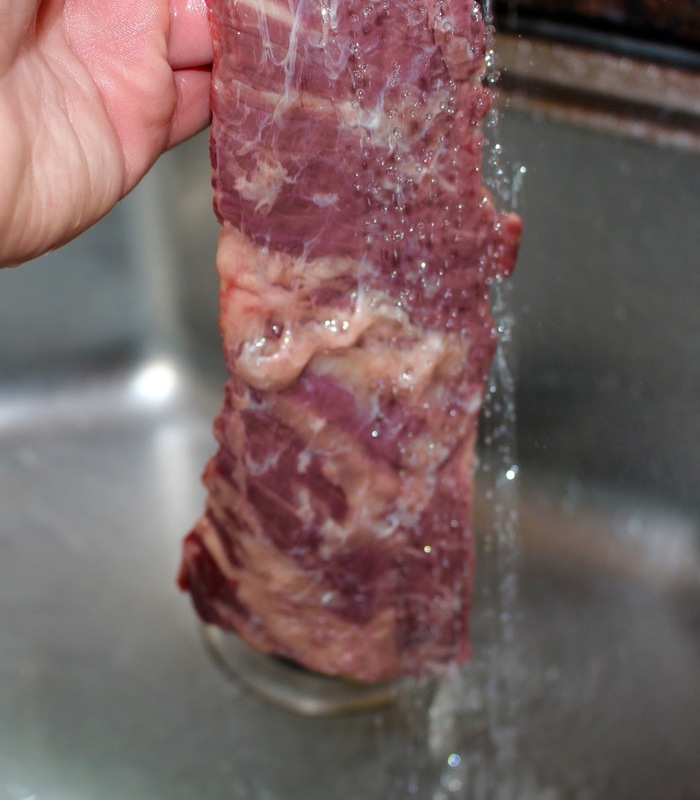 Before preparing meat, always rinse it in warm water and pat dry with paper towel. After this, coat it generously with salt (a chef's secret to great tasting meat). Then, let it rest for a few minutes while the marinade is prepared. 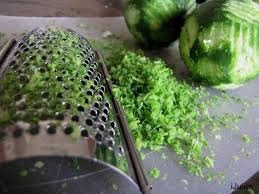 In a food processor, combine the lime juice, lime zest, onion, thyme, cilantro, garlic, dash of salt, lots of freshly ground pepper, and worcestershire sauce. Puree until all the ingredients are loosely combined (above). Coat the meat on all sides in a large glass dish. 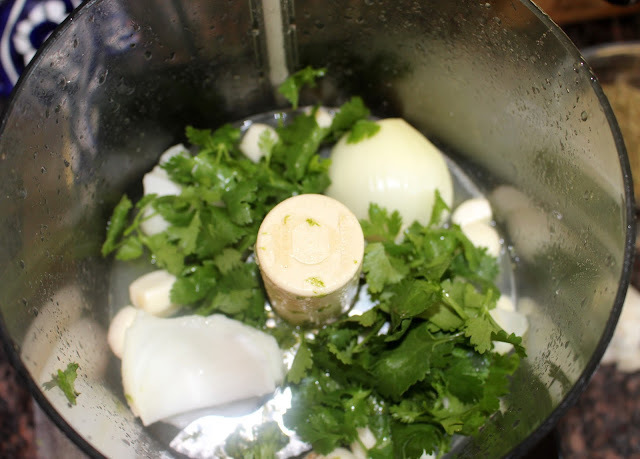 If time permits, allow the meat to marinade over night. 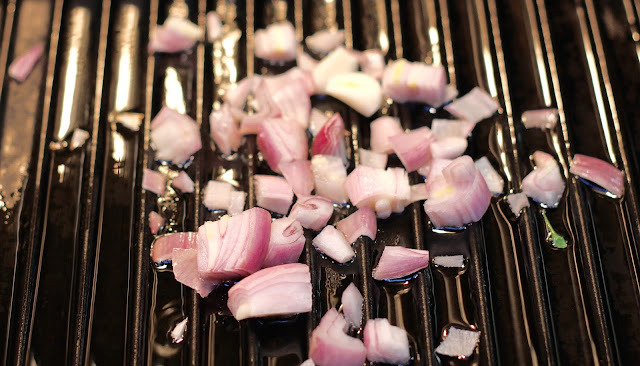 If using a grill pan, be sure to season it with a tablespoon of olive oil, some shallots and 2 cloves of garlic for about 1 minute (until golden brown). Shallots make almost everything better, and are another secret chef ingredient! 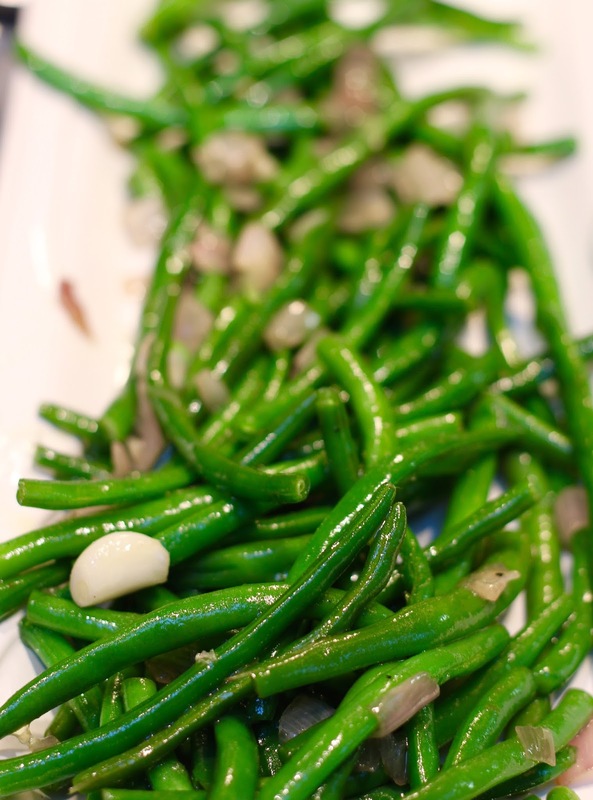 On this occasion, before grilling the meat, I quickly sautéd some haricot verts (green beans) that I blanched beforehand. Just before taking them out of the grill pan, I added a tablespoon of fish sauce, which knocks this side dish out of the ball park! These wonderful greens did not last long at my table! Grill the steak on medium-high heat in the shallot infused oil. It only needs 3 minutes on each side. For well done, grill for 4 minutes on each side. When grilling meat, don't guess, use your timer! After removing the meat from the grill, always let it rest for a minute or two before cutting. In the summer, I serve the meat over a bed of lettuce coated in a garlic, lemon, parmesan dressing. The hot and cold together are delectable, and not too heavy! 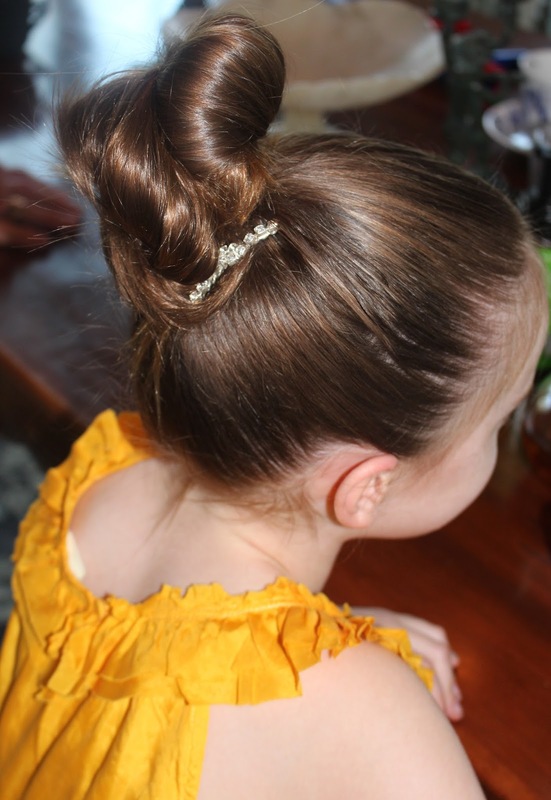 undemanding, hardy and comes in a variety of sizes and colors. This time of year a fair amount of my free time is spent working outside. Our gardens, both in the city and by the beach, become outdoor rooms, frequently used for socializing, entertaining and easy living. So designing these spaces artfully is as important to me as accessorizing my living room; and by the beach particularly, when all the doors are wide open, the two need to seamlessly and harmoniously blend together. Thus, I need to constantly re-tool and update the composition of my gardens as the season progresses. 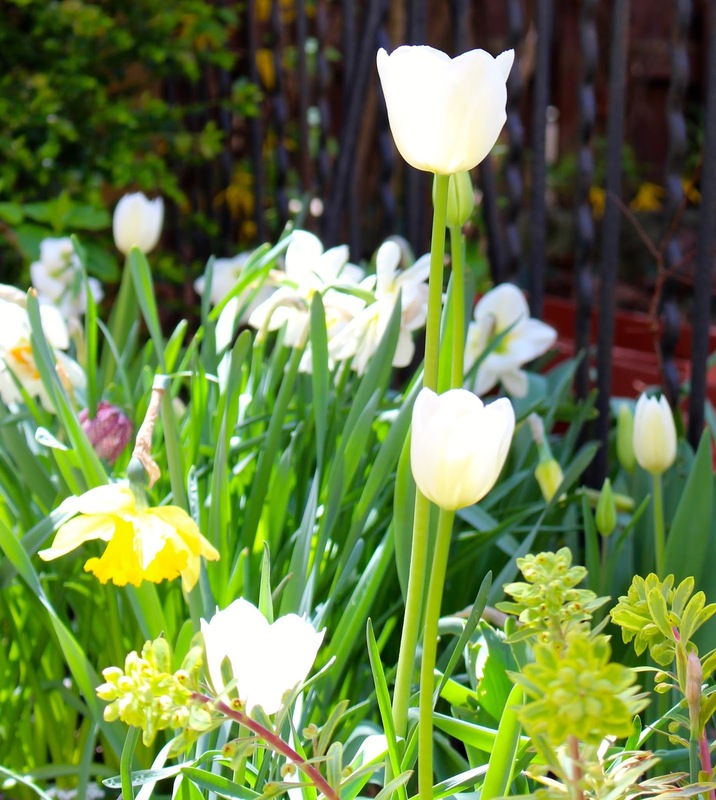 In New York City, our springtime plants -- tulips, narcissus, squills, helleborus, etc. -- have ended their flowering cycles. Time to re-tool! Caring for these plants, at this point, is as important as when the bulbs were first planted in the fall. Narcissus (daffodils) are known to be fairly fool-proof plants -- they don't get eaten by squirrels, they produce large amounts of flowers year after year, and there isn't much to be done to them. 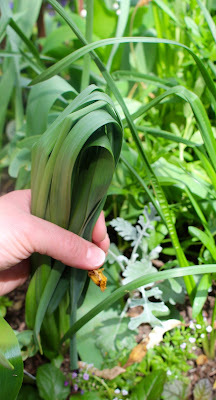 Well, with one exception -- once the flowering has finished on these hearty plants and the leaves look droopy and yellowed, they should be carefully clumped and knotted (see simple instructions below). This serves two purposes. One: it allows the energy from the plant to refocus back into the bulb in the ground; two: it allows other plants in the garden to use the space for their own flowering and propagation. Once folded (above), use the top portion to form a knot around the fold (below). For my modest garden in the city, it took less than an hour to perform this task. In another month, I won't even be able to see any evidence of these bulbs. 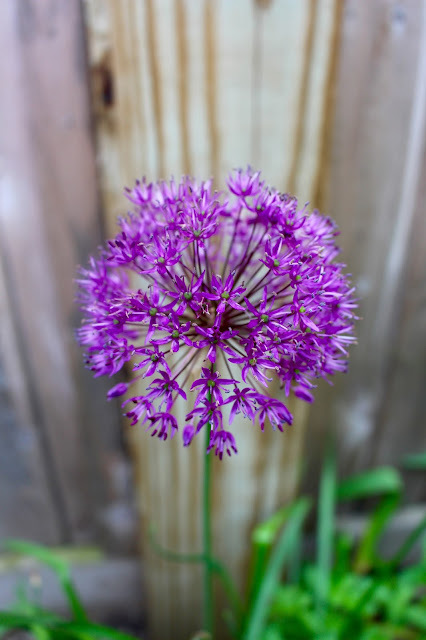 But, if you don't have the time or stamina to clump and knot these leaves, when planting your bulbs in the fall, consider placing them close to large leafy annuals and perennials that mature in early summer. Interplant them with your Ornamental ginger or hosta. 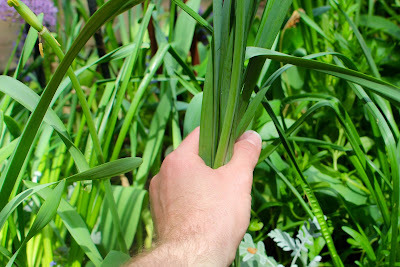 The large leaves of these summer plants will hide those of the spring bulbs. Shrubs which flower in the spring should also be pruned in the early summer. Pruning your shrubs promotes vigour and keeps plants within manageable sizes. Fertilize your plants, in the late spring/early summer, and try to use organic natural products, especially if children use the garden. Your plants will flower longer and look healthier all summer. 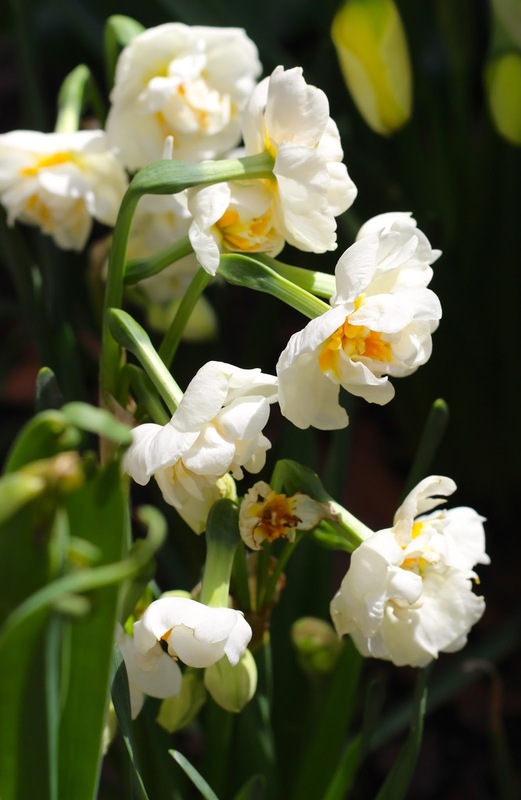 Over time, bulbs, such as narcissus, that self-propagate new albeit smaller bulbs, can be dug up, divided and replanted. In general, plants that bloom in the spring should be divided in the fall (when they are dormant) and fall bloomers in the spring. More on that later. If you happen to pass a yard sale of someone who maintains a respectable garden, stop by! Strike up a conversation and be sure to compliment the garden. You will learn valuable tips about what grows well in your area, where the best places to shop are located and you may even walk away with a few clippings. Gardeners inevitably love to talk about their gardens and always enjoy praise for all their hard work! 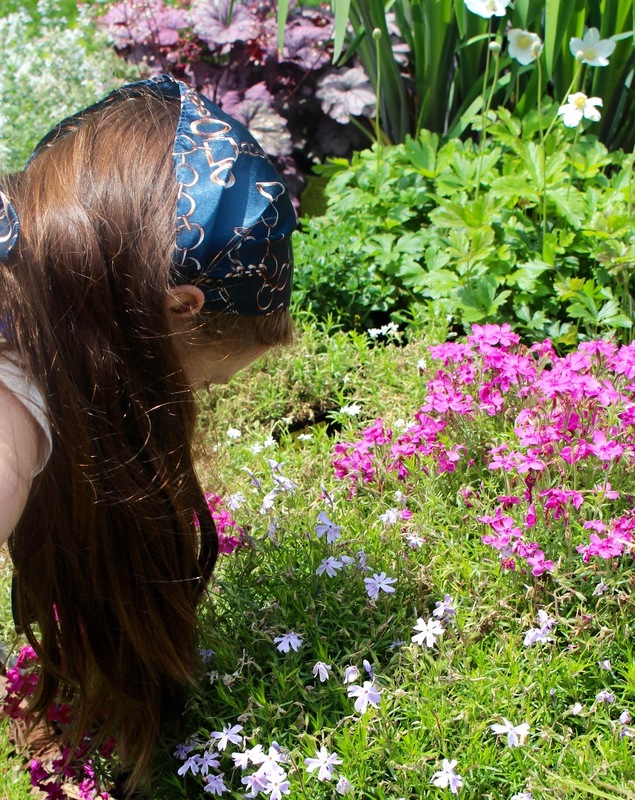 Our daughter enjoying the freshly flowering phlox. With any luck, she will grow to share our dedication to the garden, to design and to good food. In New York City gardens, it seems that Helleborus is this year's IT plant, and with good reason. This superb plant is lush, comes in a variety of colors, and is shade tolerant. 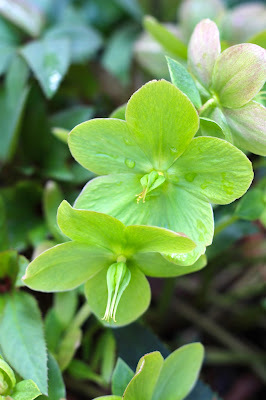 While I prefer the subtle creamy green and soft white petal varietals (above), more common (and less expensive) are the hellebore that have dramatic, rich plum, almost black colors. And while all the Hellebore's are a worthwhile investment, if you can find the extravagant Helleborus orientalis -- buy it! Its flowers delicately and outwardly triangulate in an incredibly elegant way. Along with the Crocus and Cyclamen, the Helleborus is one of the first to appear -- in late winter and early spring -- and it flowers over a long period. Its perky early color begins to appear while there is still snow on the ground and depending on the spring weather, often continues until the Azelias are in full bloom (late spring). It gives a lot of flower bang for the buck! 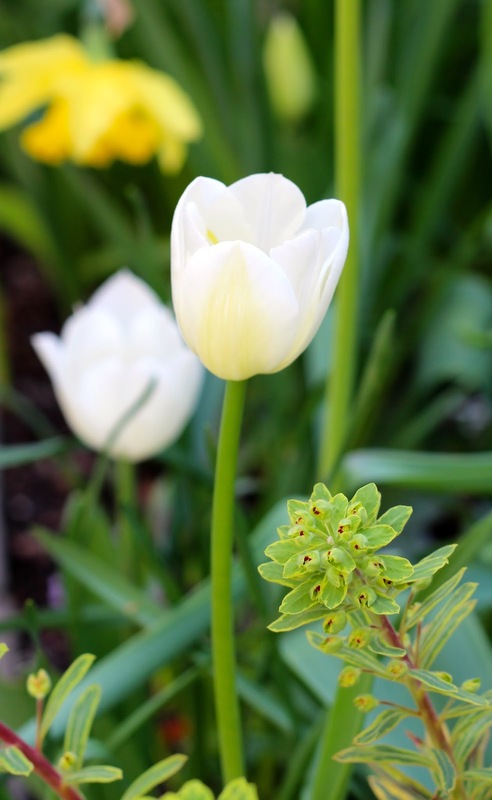 In my garden, I paired this hearty treasure with off-white tulips and the double narcissus, the less common and more interesting daffodil. The double narcissus (below) almost looks like a small creamy peony or sculpted gardenia, has a huge flower and has wonderfully layered ivory petals. It's not your grandmother's ubiquitous Narcissus! I planted my tulip and narcissus bulbs in the late fall (talk about delayed gratification!) and for this year's garden, I stuck mostly with off-whites. 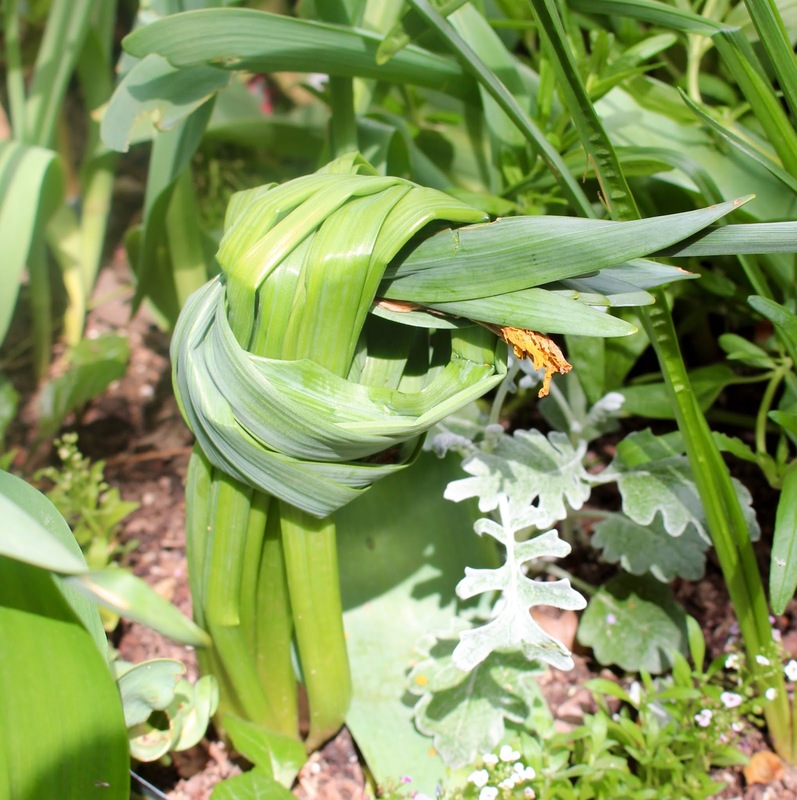 The yellow daffodil (above) is a regrowth, self propogating offset from last year's planting. In a small garden, creams and whites add some depth when placed in spaces that have huge sunlight and shadow contracts. White is also a great color when visits to the garden are limited to the evenings -- white(ish) flowers can act like little lamps. Zinc container from Restoration Hardware. I look forward to seeing that Alyssum cascading down the sides. 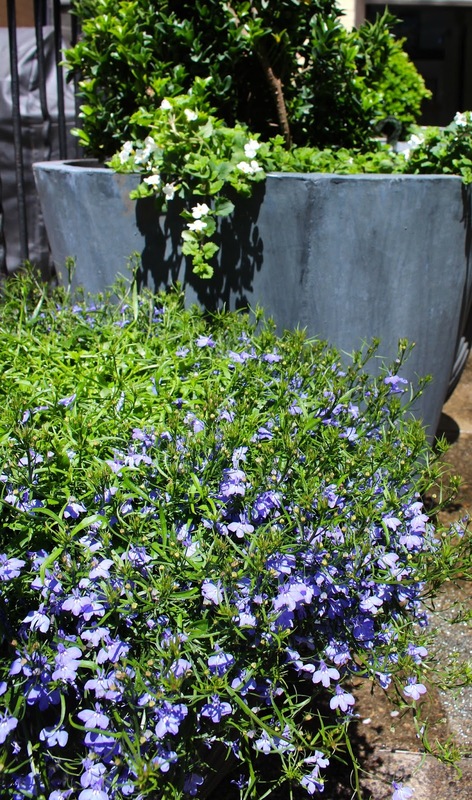 But, my favorite new feature in my spring garden is the recently purchased zinc planters from Restoration Hardware. The last few winters have been harsh here in New York, with much snow and drastic temperature swings. As a result, I have had to replace multiple broken plant containers. This year, I decided to invest in high quality containers that will withstand our erratic weather. Terra cotta and wood simply do not hold up. Zinc, while almost prohibitively expensive, is expected to last. 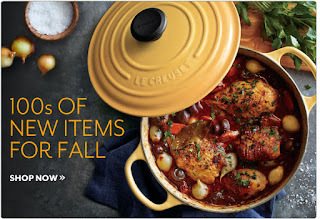 I hope to buy more zinc containers at the end of season sales! High quality planters are an essential ingredient to any garden. Adding height will give it multiple focal points. The height also helps to incorporate a useful rule in planting -- use delicate foliage at higher levels and bolder, thicker, heartier planting at the lower level. The only downside -- planters need to be watered more often than in-ground plantings. Planters grouped together can also double as a mixed bed, particularly on a deck or concrete area where there isn't any soil. They also provide foliage to otherwise dead zones. In my new zinc containers, I planted Euonymus bushes for height and for its attractive variegated leaves, and at the bottom, Allysum, for its creeping and cascading qualities. If your garden includes shady spots, try Ornamental Ginger (above). The eye-catching fan shaped leaves are great ground cover, require little maintenance and are easy to split and propagate. 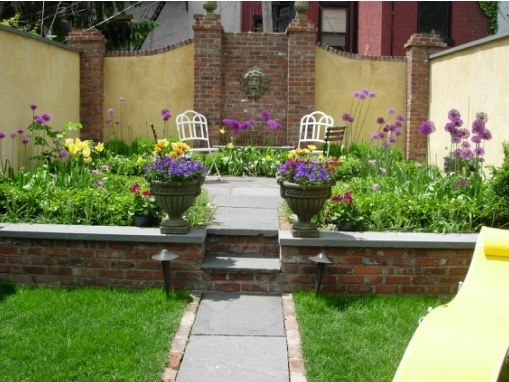 Above -- a garden I designed for our last house in Brooklyn, the handsome purple spikes are Allium, which flower in the early summer and bring delicious drama to the garden (Allium are in the onion family). 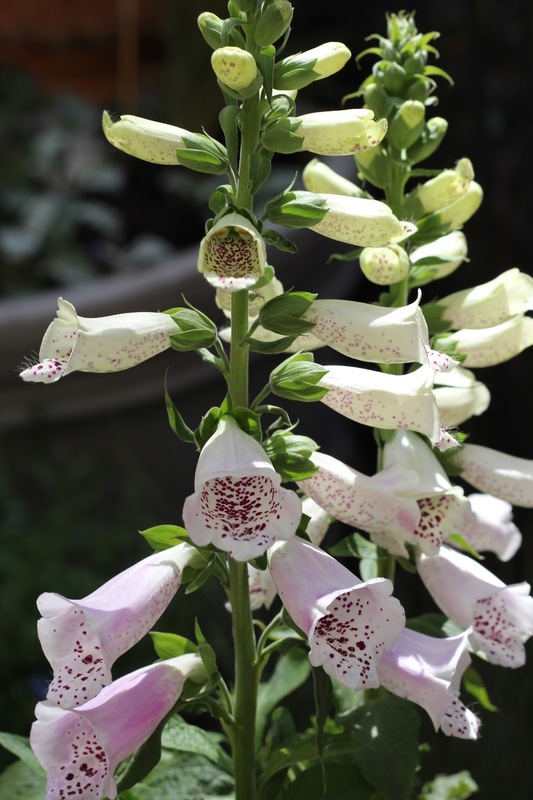 Digitalis (common name - foxglove) add height to any garden and are wonderfully elegant when flowering freely against shrubs. Be sure to plant with bark ships, to help keep roots cool in the hot summer. Don't forget to Dead Head -- or remove faded flowers from the plant. Not only does the plant look better, but dead heading prevents energy moving into seeds, keeping the focus on the flower. Frontgate and Restoration Hardware are also great sources for planters and outdoor furniture. 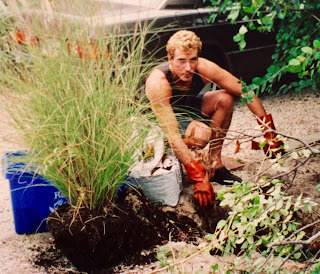 That's me, gardening in the Hamptons a fews years ago.